With the PAY LATE and be FINED offer as we call it, so commonly now installed in householder's electricity bills across Australia, you would think you only need to pay attention to any rate on offer YES? Well NO as the offer can be quite different and easily save you less or more depending on your final choice. It certainly pays to read the fine print here! A discount off your total amount before concessions - NOT CLEAR Pre Post GST? A discount off your total billed amount - NOT CLEAR Pre Post GST? A discount off your usage charges for 12 months when you pay on time - NOT CLEAR as one could pay one bill on time and is the discount then applied to all others over a 12 month period, irrespective of paying the other bills on time? 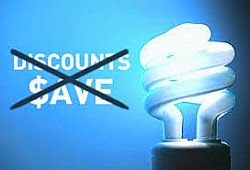 A discount off your power rates - NOT CLEAR as what are the Standard Power rates and does this include usage / supply? So as you can see NOT SO CLEAR! Now we did pass this list around a few clients for a better understanding of what they thought was on really on offer. And we were all confused a little with some of the explanations. The term 'total' and 'total billed' can be confusing to some householders, as it may be thought to include GST! As that is the total billed we would say. We think it does not though, but how about some clarity please Mr. Electricity Retailer! So as you can see the discount can be off the usage and include or not, the daily supply charges. Now if your supply charges are $1.40 per day for example, this is going to make a very big difference, especially on a small bill where the daily supply charges are in fact more than the usage! And that is the case with our electricity bill. One day we hope to see standardised bills across all electricity retailers with some form of regulation to keep the electricity billing across Australia accurate and in order. It is about time Electricity Retailers showed more Good Faith! Now if you are having issues with your electricity billing, yes we have a page of ELECTRICITY BILLING ERRORS and also offer you a METER & BILL CHECK SERVICE.